Inside: Do you find yourself changing homeschool curriculums every year, or even more frequently? 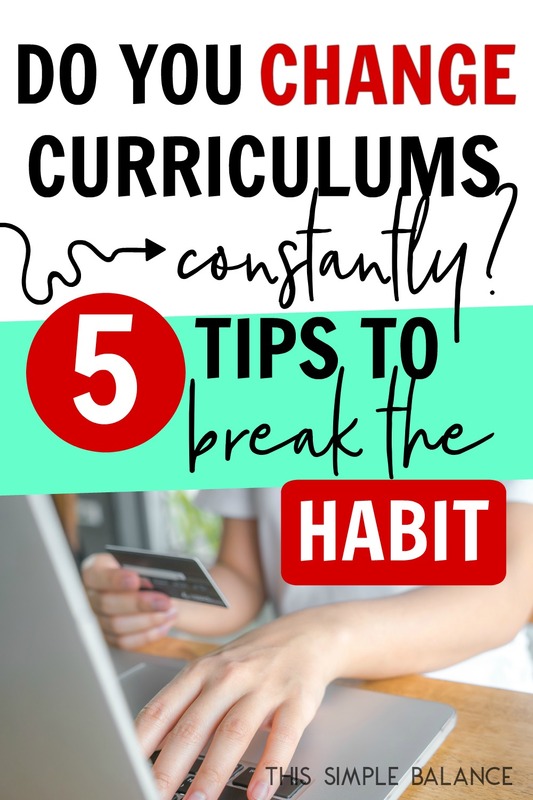 Learn how to break the habit and to be content with the homeschool curriculum you already have. Over the past week I’ve jumped into a few Facebook groups for homeschool moms to ask my own homeschool curriculum questions. I couldn’t help but stay a while and look through the different threads. As a homeschool blogger, I particularly enjoy reading posts recommending new curriculums I’ve heard of, but never used personally. Once? I wouldn’t have given it a second glance. But multiple occurrences of the same statement got my wheels turning. Why are homeschool moms changing homeschool curriculums so frequently, even when nothing is wrong with what they currently have? And an even better question: why can’t they stop? 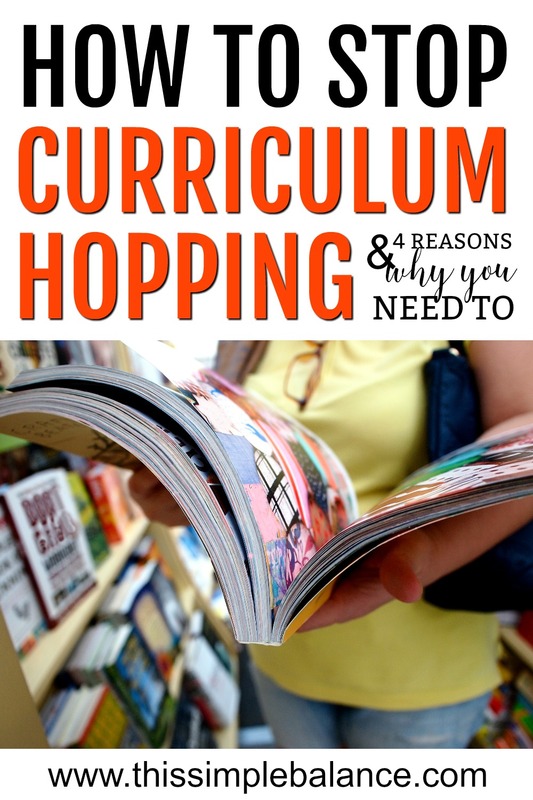 First, let’s define “curriculum hopping”. I’m not talking about periodically rethinking your curriculum here, or occasionally trying something new. When I say curriculum hopping, I am talking about a chronic, borderline habitual behavior where you change curriculums for more than one subject every single year (or maybe every six months?) for no good reason and with no clear purpose or aim. In other words, you’re constantly searching for the homeschool magic bullet. Before I even jump into why we change homeschool curriculums so frequently, let’s address why this is even a problem. Behaviors are hard to change if you have no motivation to change them, am I right? Homeschool curriculum is soooo expensive. Or at least, it can be. My first year homeschooling, I spent close to $700, and that was buying used! Most homeschooling families I know don’t have a ton of extra cash floating around, so changing curriculum every year adds up, especially if you end up abandoning it later on. Maybe you do have disposable income to purchase different homeschool curriculum every year. But think of all the other things that money could be used for. I’m a minimalist mom. As a homeschooler, this makes my life slightly complicated. I’ve had to come to terms with the fact that we are always going to have more stuff that the average minimalist family. But even still, we don’t have a ton. I’ve seen humongous homeschool rooms, literally filled with bookcases and shelves with bin after bin of manipulatives and supplies. I’m not gonna lie – I have to click away because I just can’t imagine ever having or needing so much stuff in my home! I’m sure you’ve read the studies: clutter increases stress, especially in women. Naturally, women are often the ones who deal with the clutter day in and day out. And I think homeschool moms have enough stress without extra clutter. Every single thing you bring into your home takes time: time to organize it, time to look for it, time to clean it, time to get rid of it when you want to. Being mindful of what you bring into your home in the first place can save you a TON of time and stress. It frustrates the heck out of your kids. This one is situational and dependent on your children’s personality. Some kids like constant change. Especially if your kids are happy with the curriculum you are using, you changing it has got to be frustrating, even if they can’t verbalize it. It creates an atmosphere of discontent in your homeschool. 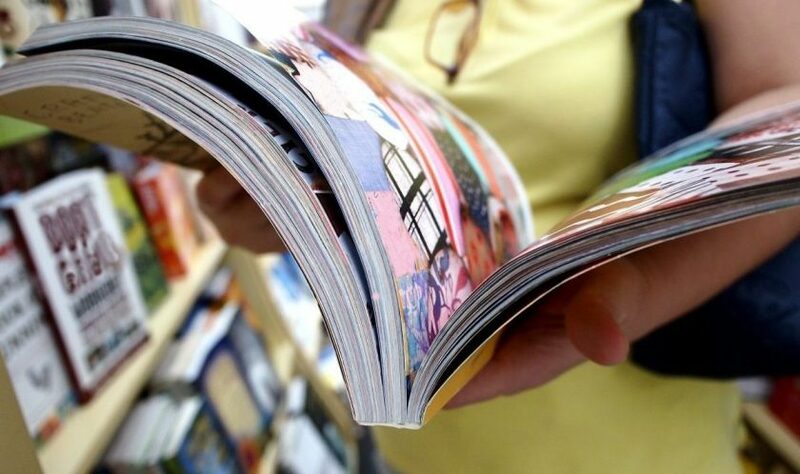 Every time you buy a new curriculum, the old one loses its luster. They put out new iPhone models every year for a reason. It doesn’t matter that the one you have can do pretty much the same things as the newer model. They tempt you with a slightly better camera and this new app and that new gadget. And maybe you do need a better camera. Maybe you do need more space. But maybe phone you have is working just fine. Maybe it gets the job done. And every time you buy the newest model, it makes the next one harder and harder to resist. Really, you’re searching for the perfect homeschool curriculum, the one that feels right in every way and makes every homeschool problem go away. The problem is that the perfect homeschool curriculum doesn’t really exist. So you’re convinced: but now you need to break the habit. There just might be withdrawal symptoms, depending on how often you’ve changed curriculums. 1) Honestly assess the situation. Take some time to step back from the day to day homeschool craziness. Ask yourself what is really going on. Are you bored? And is that boredom a “If I have to use this curriculum one more day, I’m going to scratch my eyes out!”, or more of a “I love and want new and shiny and exciting.”? Are your kids struggling? And if they are, will a new curriculum really fix that or do they just need to push through it? Can you easily keep using what you have with some tweaks, modifications and skips? Is your homeschool mom confidence shaky and are you trying to find that confidence in a curriculum? This may take some solo soul-searching, processing with another homeschool mom friend, or something else. Once you get some solid answers to these questions, you will have a better idea of whether you actually need a new curriculum or not. 2) Don’t go to homeschool conventions or homeschool stores without an express purpose. I’ve never been to a homeschool convention, so maybe I have the wrong perception. But besides the homeschool mom camaraderie (the same camaraderie you can find in a local homeschool group) and the speakers (podcasts or online homeschool conferences, anyone? ), they seem to be an excuse for homeschool moms to go shopping and homeschool marketers to make bank! Now, there’s nothing wrong with shopping if you actually need to go shopping. But there’s a reason I don’t go to Target anymore without a very specific purpose. Because we all know what happens at Target, right? You feel like you need EVERYTHING, and the feelings of missing out are tangible if you leave the store without all. the. stuff. Yeah, you know the feelings I’m talking about. Marketers are brilliant, and homeschool marketers are no exception. I don’t think I’ve quite seen anything like it except in the blogging world (where the feelings of desperation are similar). Homeschool moms are desperate to succeed and few of us are extremely confident in our choices because guess what? Most of us were never homeschooled ourselves. We are feeling our way forward in the dark, and anyone offering a flashlight (or a floodlight, perhaps) in the form of a nicely packaged curriculum has our undivided devotion. We’re pretty easy targets for the next homeschool guru telling us how homeschool curriculum X can change our homeschools. Don’t browse unless you have an extremely strong willpower (and your spouse has taken your credit card out of your wallet). 3) Remember why you chose your current homeschool curriculum in the first place and accept that no homeschool curriculum is perfect. There must have been something that led you to buy the homeschool curriculum you have. What drew you to it in the first place? Did a friend wholeheartedly recommend it? Did it seem like your style? Does it reflect your homeschool goals/vision? It’s so easy to see the flaws. Remembering the things you love about it is harder. Isn’t that true of just about everything? Life of Fred Math, for example. I love that math curriculum in general, but I’m not going to lie, sometimes Fred can seriously grate on my nerves. The storyline is flat out crazy sometimes (128 scoops of ice cream on a single ice cream cone, really?!). But I remind myself that I love the way Life of Fred teaches my kids math. I love that my kids love it and beg to read Life of Fred on the days we miss. I love that I can use it with all my older kids. I love that they are getting big math concepts (concepts that some high schoolers don’t understand) through story and verbal discussion. All the pros are too much to throw away for a little irritation at the ridiculousness of the storyline. And besides, my kids love the ridiculousness. It makes them laugh. 4) Learn how to appreciate the beauty of a different curriculum without needing to actually buy it. This is a concept borrowed from minimalism. We all need to learn how to appreciate beauty, whether that be in a store, in someone else’s life, or in a curriculum without needing to have that thing. It’s admiring a throw pillow at a store for its beauty and putting it back because we know that we don’t really need more throw pillows. We have enough. It’s appreciating the way a friend thinks up all these creative traditions and pulls them all off so beautifully every year and not needing to do the same. You are who you are, and she is who she is. Both are beautiful. It’s looking at that gorgeous, shiny curriculum that models all our lofty homeschool ideals and putting it back on the shelf. It’s beautiful, really, but your homeschool is starting to look a lot different than your original ideals, and that’s a good thing. Learn to admire without buying. That ability will serve you well for the rest of your life. If you’re discontent in your homeschool, you’re probably discontent in other areas of your life. I’m not immune! It’s taken me a long time to embrace where we are at in life, the ramifications of the life choices we’ve made, and come to grips with my own limitations/weaknesses and those of my family members. Discontentment needs to be fought with gratitude. Gratitude that we can even homeschool in the first place. Gratitude for the money to buy homeschool curriculum. Gratitude for the number of choices we have compared to every other generation of homeschoolers. Gratitude for our own ingenuity and creativity that can find a way to use what we have and to make it work. There is so much to be thankful for! When we fight discontentment with gratitude, the need for something new slowly fades away. What If You’re Just in a Curriculum Hopping Season? The first year or two (maybe three) of homeschooling, some curriculum hopping is expected and even necessary. You’re figuring out your homeschool style, your children’s learning styles, what works for everyone and what really, really doesn’t. My first year homeschooling, my daughter attended a university-model school. The school chose the curriculum for me. I learned what I liked and didn’t like. The second year, I chose Sonlight. I bought a used core and Saxon math (shudder) and used it for about five months. Actually, we ditched Saxon after two or three weeks. But we stuck with Sonlight for five months. I learned a ton about our homeschool style, what I liked and didn’t like. I used that knowledge to choose curriculum our third year that stuck. We actually ended up using pieces of Sonlight’s curriculum. We aren’t adding anything new this year, and I plan on sticking with pretty much everything for the next several years. Give yourself a break the first couple years. If you’re beyond year three and you’re still hopping, you *might* have shiny new curriculum syndrome and a curriculum hopping problem. Personally, I hated Singapore math – I just couldn’t get behind the way it taught math. Saxon was so boring, I literally couldn’t look beyond week two without picturing my kids hating math for all eternity. I toyed briefly with Math-U-See, but eventually ended up with Life of Fred Elementary Math and haven’t looked back. It’s working for us, at least for elementary math. For the rest of math? We’ll see. So sometimes, you do need to change curriculums. 1) It’s boring, boring, boring. Now there’s a difference between a boring curriculum, and you being bored. It’s a very fine line, so let me explain. But sometimes, it’s just your personality and you need to find ways to meet your need for change without breaking the bank and driving your kids batty. Some personalities literally need change: they die inside without it. Sometimes, your curriculum is as dry as parchment paper, and there is absolutely nothing you can do to make it better. You need a new curriculum. 2) Your kids are constantly hitting roadblocks with your current curriculum. Sometimes kids are struggling because they need to, and something they are struggling needlessly. Telling the difference is a real challenge. If you suspect this to be the case, I recommend talking with one or two veteran homeschool moms. Tell them the roadblocks you’re hitting and ask them their advice. They should be able to ask your more questions and help you determine whether you really need a new curriculum or not. If you can try a new curriculum with a sample lesson, this will give you more information to go on before you make a buying decision. 3) It doesn’t line up with your homeschool goals/vision or your philosophy of education. If a curriculum isn’t helping you achieve your goals for your homeschool and it doesn’t teach the way you believe kids should learn, it’s probably time to reconsider your curriculum choices. Will I never change curriculums again? I don’t think I will, but never say never. Right now, what we have is working for us, and I see us using the same resources for the next several years. We will, of course, need to add to what we have as my kids get older. I have my eyes on a grammar curriculum that matches our homeschool style. I anticipate using more and more Brave Writer resources as my kids grow. But for now, I’m content. When I’m in Facebook groups looking for curriculums, it’s because I want to have more recommendations for homeschool moms who need something other than what I know well and have used personally. Whenever I’m tempted to look beyond what’s working for us right now, I try to remember that school used to be much simpler than it is today. Kids learned how to read and write and do math with just a few readers and a simple chalkboard slate. Surely what I have right now is enough. I hope that you, too, reach a similar level of contentment with the curriculum you have chosen. I hope you come to terms with the fact that there is no perfect homeschool curriculum, no magic bullet you’re missing. 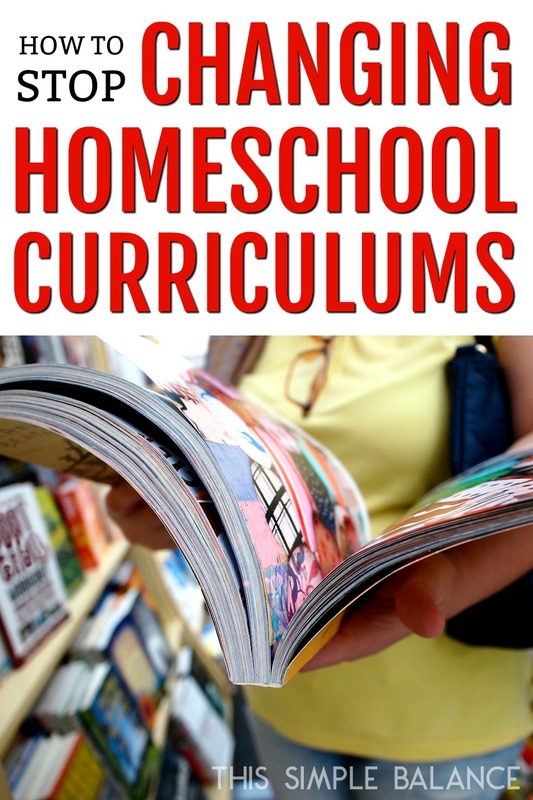 And if for whatever reason, the curriculum you have now is not serving you well, that you will quickly find the best homeschool curriculum for your family without spending months and months curriculum hopping. Know another homeschool mom who needs to stop changing curriculums, too? Share this!